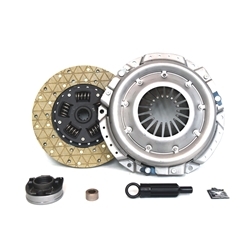 01-017.3K Stage 3 Kevlar Clutch Kit: Jeep CJ J-10 Wagoneer - 10-1/2 in. Recommended for Off-Road and Rock Crawling Applications! This is a Phoenix Friction Stage 3 Kevlar Street Performance Clutch Kit. The kit features an original stock pressure plate and a Phoenix Friction high heat Kevlar spring dampened disc. This Kevlar clutch guarantees a chatter free engagement, and is without a doubt the smoothest engaging clutch on the market today. It will provide up to a 45% increase in engine torque capacity over the OE clutch. At the same time, you will not notice any increase in pedal effort over the stock clutch. Since there are no metal or abrasive particles in the friction material, Kevlar significantly reduces flywheel wear, and provides 300% longer life than that of original equipment under normal driving conditions. Note: Kevlar is a high tech material that needs up to a 1000 mile break in period to properly seat for optimum performance. A Phoenix Stage 3 Kevlar performance product is a direct factory fit and requires no modifications for installation.